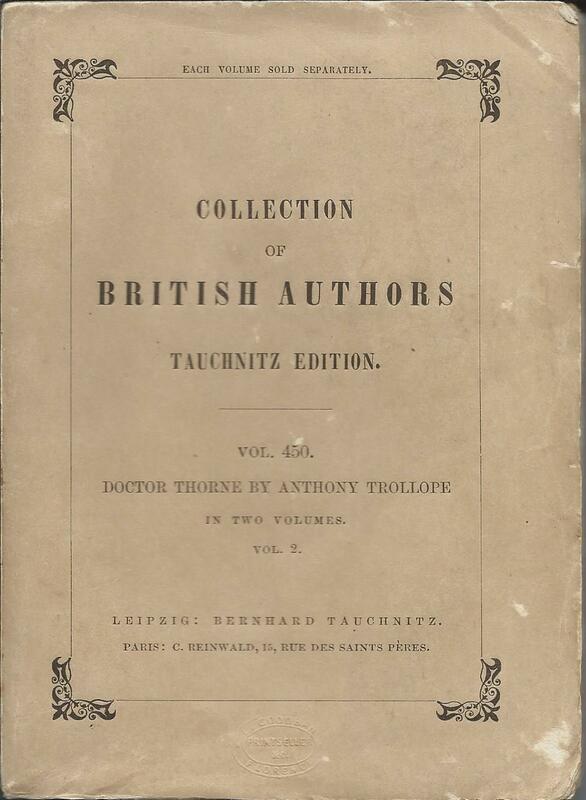 The Tauchnitz ‘Collection of British and American Authors’ runs to well over 5,000 volumes and includes almost every significant work of English literature published between 1840 and 1940. But this is no series of classic reprints. It’s a series published in Germany with copyright for sale in Continental Europe, and most volumes were published more or less simultaneously with first publication in Britain or in the US, sometimes even in advance. It includes works by Dickens, Hardy, the Brontë sisters, Kipling, Trollope, George Eliot, Henry James, Conan Doyle, Mark Twain, Bernard Shaw, H.G. Wells, Robert Louis Stevenson and a host of others. As a record of contemporary English literature over that period, it is completely unmatched. When the series was first launched there was no recognised international copyright convention and it was common for English language novels to be published in Europe without any recognition of copyright or any payment to the author. The founder, Bernhard Tauchnitz, pioneered the practice of obtaining authorisation and making payment to authors, and successfully built relationships with the leading authors of the time that enabled him to get early access to their works. He was barely 20 when he launched the firm and by the time he died in 1895 the series ran to over 3000 volumes. The firm was inevitably weakened, not only by his death and that of his son, but by the First World War and the difficulties in Germany that followed it. It faced many competitors over the years, but retained a dominant position in English-language publishing in Continental Europe until the launch of Albatross in 1932. Within two years the new company had effectively taken over control of its much older rival. Ownership of the Tauchnitz firm passed to its printer, Oscar Brandstetter, but editorial control went to the Albatross team. The Albatross and Tauchnitz series were run in parallel until the Second World War. The main Tauchnitz series ended in 1943 with the destruction of the Brandstetter premises in a bombing raid. Attempts to revive it after the war had little success. 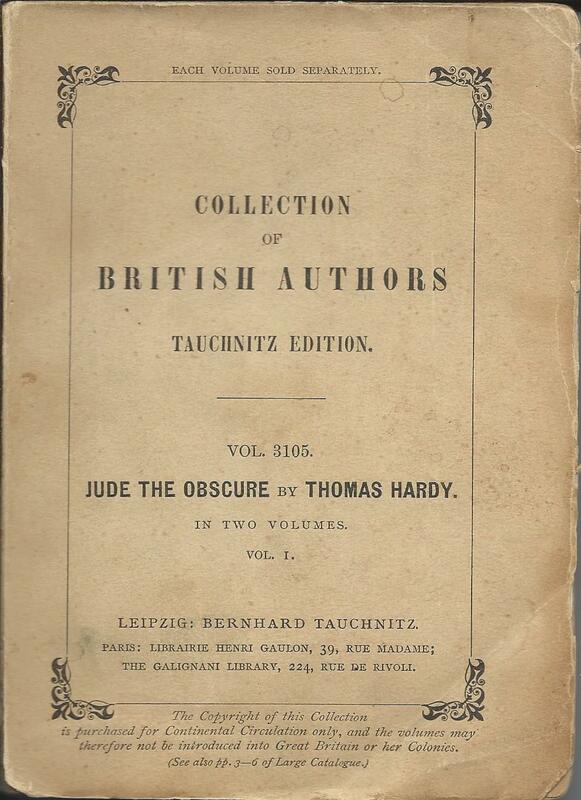 The basic Tauchnitz editions were issued in paperback, but it was common in the 19th century for buyers to take them to their own bookbinder to have them bound. The result is that they now come in a huge variety of bindings from the utilitarian to the sumptuous, as well as in the original paperback form. In principle they are not rare or difficult to find. Most second-hand bookshops in Britain and throughout Continental Europe will have one or two, and there are thousands for sale on the internet. However it is difficult to recognise first printings, often almost impossible without the help of the Tauchnitz bibliography by Todd & Bowden. Most copies offered for sale, even when described as first printings, are actually reprints. First printings are more difficult to find and the sheer number of volumes makes it a huge challenge to collect them. No library has a complete collection and most library collections include a high proportion of reprints. My own collection is also far from complete, but is largely made up of first printings as far as I can tell. It is particularly strong in paperback first printings and in the early editions. Although there has been a lot of research on Tauchnitz, including by Todd & Bowden, and by other academic researchers, there are still lots of areas that are poorly researched or understood. I’ll be writing about the series and the firm from the point of view of a collector rather than an academic on this blog, and there is much more at my website www.tauchnitzeditions.com.